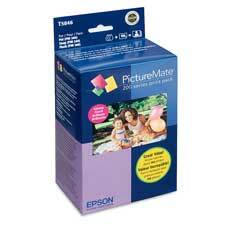 Premium Quality T-5570 6 Color Inkjet Cartridge compatible with the Epson PictureMate. The use of compatible supplies does not void your printer warranty. 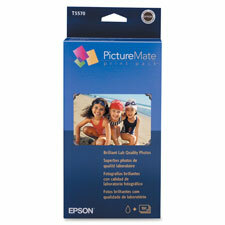 Premium Quality T5846 Color Inkjet Cartridge compatible with the Epson PictureMate Dash. The use of compatible supplies does not void your printer warranty. The PictureMate Print Pack includes 100 sheets of 4" x 6" glossy PictureMate Photo Paper and a photo cartridge for printing about 100 borderless 4" x 6" color photos. Allows you to print photos easily when and how you want in the convenience of your own home or office. Offers longer durability, with prints resisting fading as much as two to four times longer than the leading brands of photo lab prints and other dedicated 4"x6" printers. Genuine OEM Epson T5846 Color Inkjet Cartridge. They are designed to work in the Epson PictureMate Dash printer/copier(s). Premium Quality T055720 6 Color InkJet Cartridge compatible with the Epson PictureMate 6. The use of compatible supplies does not void your printer warranty.